So how much weight can you expect to lose? 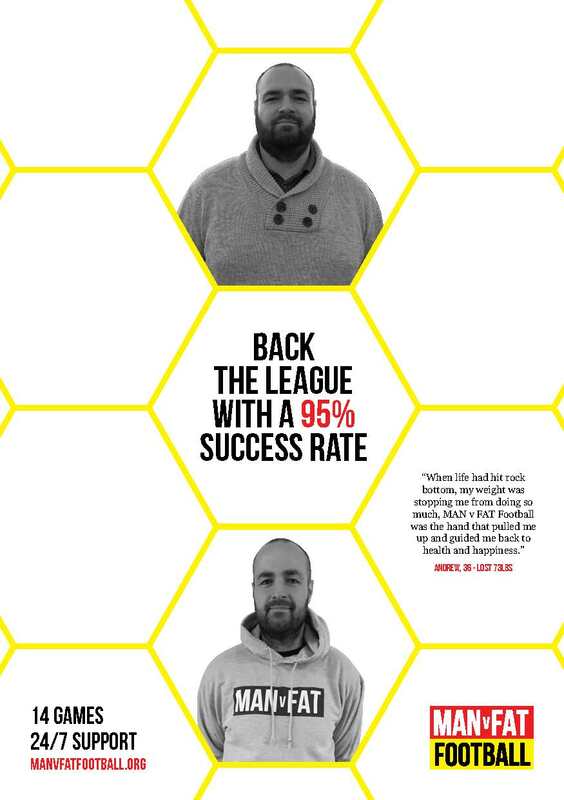 In an assessed 14-week pilot scheme run by Solihull Council, players lost an average of 22lbs, with 62% achieving their 5% body weight target. The maximum bodyweight percentage lost was 26%, with the maximum weight lost by one player totalling 67lbs. Overall 95% of players lost weight. Currently there are two leagues up and running in Tyne & Wear, one in Newcastle and one in Sunderland, supported by the likes of the Newcastle United Foundation, Foundation of Light and the FA. Sessions currently run on a Monday night in Newcastle and on a Wednesday night in Sunderland. Man V Fat Football are also looking to establish a league in Wallsend. Worried about joining on your own? Fear not, approximately 80% of players do, you’ll be assigned a team and the coaches will help you to get to know the other players in a friendly, welcoming atmosphere. What about cost? For leagues that are currently running, it costs £9.99 to register as a player, or £17.99 with a copy of the five-star rated MAN v FAT Weight Loss Manual (RRP £12.99). You then sign up to a league and pay £25 per month. So what are you waiting for? Sign up today and join a group of likeminded men using the power of football to change their lives for the better. Alternatively, you can email football@manvfat.com or phone on 0845 163 0042. Read the information around why Man V Fat exists and some facts and statistics about obesity in men in the UK.